Happy Monday! Unfortunately my spring break is over and it's back to classes, but good news is that I will be graduating in one year from now with my bachelors in graphic design! How exciting! I've been loving pastels and light colors this spring. An easy way to wear them is by wearing white jeans, an over sized tee, and some pastel accessories. 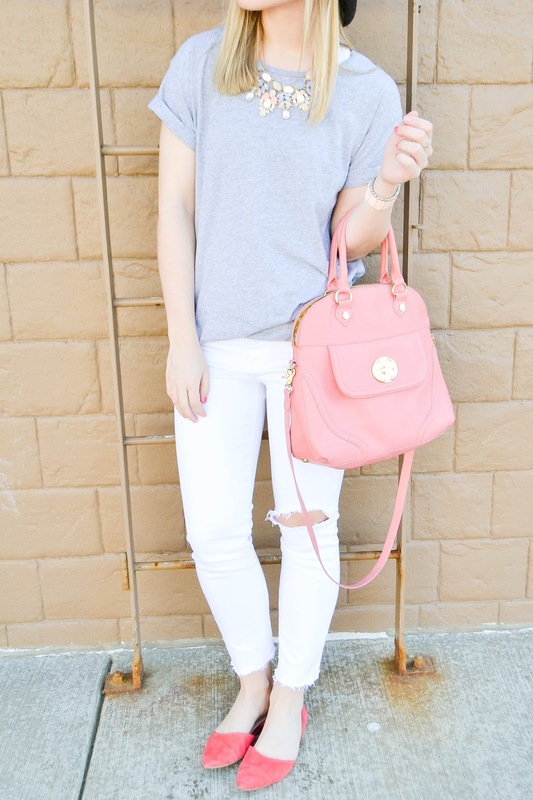 These white jeans are MY FAVORITE! They are Kut from the Kloth skinnies. I ended up doing my own distress to them by cutting off the ends of the legs about an inch above the ankle, and cutting horizontally about a half inch above the knee. I used a two-prong spiky fork to get the extra fray to the ends. Doing your own distress to jeans can add the extra touch you might be missing! I've also been obsessed with these "Coachella" sunglasses from Polette. Polette is known for their revolution of amazingly priced glasses. The frames and lenses are provided straight from their workshops, so there is no stock nor intermediates to high margins. I could literally buy every pair of glasses on their site, so cute and super affordable! An awesome plus is that you can add your prescription so you can have fashionable glasses but you're not blind, lol! All you have to do is click the 'heart' button - Thank you! I usually do all horizontal to keep it consistent but I thought I'd try something new! Pretty look, love the necklace! I love your outfit! It's very chic!